My name is Peter R. Mason and I studied Fine Art at Stafford College of Art. I am now known as the Post Pop Art Man as I create images with used postage stamps. I am inspired by the Pop Art movement and particularly admire the works of Roy Lichtenstein and Andy Warhol. My portraits and images are created by recycling postage stamps into pixelated images to create portraits and designs both figurative and non-representational. Each stamp represents a pixel. I start by drawing the image on canvas dividing the surface into stamp sized rectangles, but I often use more than one stamp per single rectangle. Stamps are sorted by colour, design and postmark pattern, and then I begin the process of finding appropriate stamps before cutting and shaping them and finally gluing them to the canvas surface. I have work owned and commissioned by clients in America, Australia, France, Netherlands and Portugal as well as in the UK. Watch this video to hear more about his work. He was commissioned by Whiteley’s Shopping Centre in Bayswater, to create a portrait of the Queen to celebrate her Diamond Jubilee. 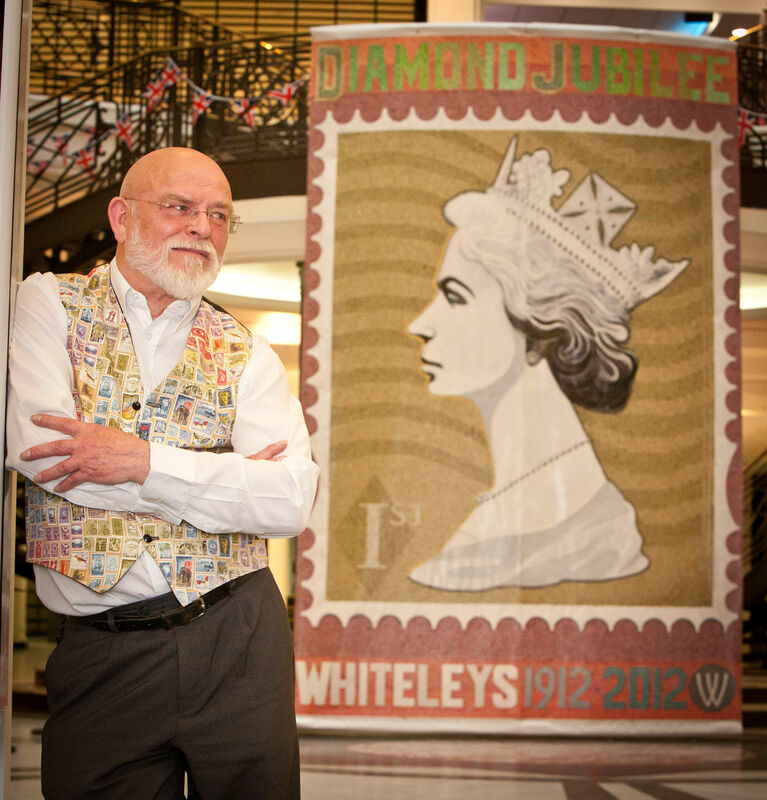 This is one of the largest stamp image Pete has created, measuring 10ft by 16ft, using over 30,000 stamps and hung in the Central Atrium within Whiteleys. Another large portrait of the Queen was created to celebrate her nine decades as monarch and is made from nine 3 foot square canvases using 30,001 stamps ‘The Sergeant Pepper Diptych’ has been displayed in several Ripley’s ‘Believe It or Not’ attractions. A portrait of Grace Jones was featured in the Post Colonial Exhibition at the Stanley Gibbons’ flagship store in the Strand, London. Amongst the work he has created are several portraits of Royal Celebrities, receiving letters of thanks from Buckingham Palace and St. James Palace. He has personally presented portraits to Bruce Forsyth, Tom Baker,and Sir Cliff Richard, together with the sporting personalities, Ron Atkinson and the former Ladies England cricket captain, Baroness Rachael Heyhoe-Flint. Peter has also featured on several radio programmes and has been invited to Channel Four and ITV television studios meeting Noel Edmonds, Paul O’Grady and Alan Titchmarsh to present them with their portraits. He has exhibited locally and at the Art Gallery in Tetbury, The Knapp Gallery, London, The Gallery at 94 in London, The Art Lounge and McDermott Galleries in Birmingham and several works have been purchased and displayed by Ripley’s Galleries in the USA.